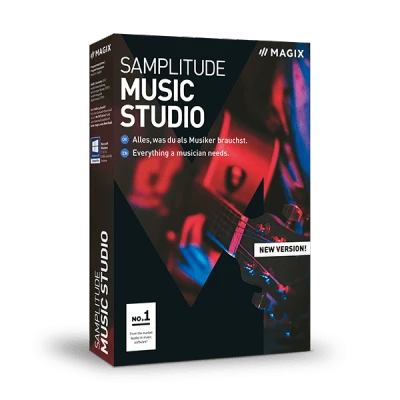 Samplitude Music Studio 2019 has everything musicians and bands need to record, mix and master their songs at an outstanding level of quality. Tons of professionally pre-produced sounds, loops and instruments and a huge range of high-quality effects and tools are included for editing audio files. Powerful 64-bit architecture ensures that Samplitude can help you accomplish even complex projects with up to 32 instruments with ease. There's no limit to the creative possibilities. It's all about your music and perfect sound results - nothing else matters. The core of your creative process. Instruments in Samplitude Music Studio. 22 impressive VST instruments form the beating heart of your music production workflow in Samplitude Music Studio. Whether you're after an original grand piano sound, atmospheric synthesizer, full-sounding drums or even a full orchestra, with Samplitude you can compose music for any genre. From rock and pop and jazz and hip-hop to EDM and gripping background music. An authentic sound experience is the result, every time. With professional recordings of brass and woodwind instruments as well as drums and strings, Vita Orchestral Ensemble is a truly impressive plug-in instrument. Vita Orchestral Ensemble is ideal for film and pop productions. But with fierce bass staccatos, full orchestra shots & strings in various playing styles, it's perfect for creating fat hip-hop beats too. A virtual grand piano that delivers an incredibly authentic sound. It's the Vita Grand Piano. This instrument is perfect for creating music in every genre. Whether classical concert music, pop productions or jazz and hip-hop - with Grand Piano, give your songs a sound that simply can't be replicated . A true original: Vita Sansula This impressive plug-in instrument gives you access to a one-of-a-kind kalimba sound and compose gorgeous, dreamy melodies that will resonate with the listener. The ethereal, harmonic sound of the sansula captivates like no other instrument. With virtual drum kit Pop Drums, you can produce beats for lots of popular music styles. The colorful mix of acoustic and electronic drum sounds offers you everything for crisp trap beats, exciting techno grooves or chilled rap. With Pop Drums, you'll always find the right rhythm. Church Organ can be used to create an authentic, stirring sound for inclusion in soulful ballads, epic background music or melodic dance tracks. The imposing tones of a Venetian organ have been specially recorded for this virtual instrument. Just like the original, this extra special Vita Instrument delivers impressive emotion and drama. A lively banjo, a soulful piano, rhythmic percussion and a dreamy acoustic guitar - with the Vita Folk instruments you can compose traditional country music or pep up modern songs with a range of extraordinary sounds. These virtual folk sounds also work really well with genres such as rock, dance and hip-hop. Bring the feeling of the coast and a fresh air of nostalgia with the virtual piano accordion, Vita Accordion. Comes in two different samples, "Styrian" and "Bandoneon", and emulates accordion sound with total authenticity. With diverse filters and effects including equalizer, reverb, delay and distortion, you can modify the unique sound of the accordion perfectly to suit your needs. Dark dreamy sequences, grating basslines and cinematic keys - for creating a film-like atmosphere, Cinematic Synth has it all. While the sounds in this Vita instrument are captivating, the effects included can also be used to create a phenomenal, otherworldly atmosphere. Ideal for film scores. Cinematic Soundscapes: This instrument is both intensely mystic and exotic and creates a breathtaking sound atmosphere for a movie score and abstract electronic music with a really dramatic backdrop. Concert Grand brings a sound that everyone will fall head over heels with. This virtual instrument has been created using a sample of a professional-quality grand piano in a concert hall and emanates the unmistakable full sound of this classic instrument. Whether used in modern pop productions or dramatic symphonies, the Concert Grand is sure to bring emotion to your tracks. Looking for extraordinary background vocals, or need extra vocal support for the chorus of your song? Then Choir is the exact Vita instrument you need. This virtual choir features crystal-clear female vocals, deep male voices and a mixed choir for creating elegant melodic arrangements. For enhanced dynamics in your music: Vita Rock Drums are impressive with their faithfully sampled kits and authentic drum grooves. Driving double bass, reverberating arena drum sounds or the crisp sound of studio drum kit - the Rock Drums have it all. Vita Soundtrack Percussion is the ideal tool for cinematic drum sounds that will bring your productions to the next level. These excellent percussion instruments add that wow effect to your songs and turn your soundtrack into a one-of-a-kind sound experience. Vita Lead Synth provides the perfect lead for the musical accompaniment of your songs. This synthesizer's unmistakable sound lets you create melodic and harmonic accents and includes powerful driving sounds for creating energy and excitement in your tracks. The legendary Vita Drum Engine offers a huge range of electronic drum kits but also preset sounds and a sophisticated interface for programming awesome grooves. With realistic sounding brushes, tom toms, ride cymbals and hi-hats, Vita Jazz Drums adds the right groove and a true jazz edge to your productions. Add the atmosphere of a smoky jazz basement to your songs. Get ready for banging club sounds. The DN-e1 is a virtual analog synthesizer that offers electrifying sounds and enables you to create experimental, otherworldly soundscapes. With driving electro sounds and vibrating basses, DN-e1 is an instrument that's club ready. Build a new groove using your own sounds. Drag audio files into the Vita sampler, which automatically cuts the files and assigns sound samples to 8 virtual pads. These can be operated by MIDI and played just like a virtual instrument. Revolta is perfect for improvising and programming your own sounds. It includes classic synthesizer sounds, ambient, West Coast and fretless bass, FX kits, virtual pads and pre-programmed sequences. Ideal for creating electronic dance tracks that pack a real punch. Access bombastic sound with BeatBox 2! This virtual instrument offers unlimited options for shaping sound for drum kits as well as brilliant effects. You can also load your own audio files into BeatBox 2 and integrate then into the beats section. Want powerful drums, distorted rhythms or dark synth sounds? Then Robota is the right instrument for your needs! This classic, four-part drum computer is impressively designed and aids the generation of new sounds as well as working with samples and oscillators. The Loop Designer enables you to easily create your own drum loops and bass lines and add more variety to your music productions. Rhythm adjustment, a variety of filters and reverse and random functions allow for even more creativity. Design loops the easy way - in no time at all. Soundpools in Samplitude Music Studio. The new Samplitude Music Studio contains 6 incredible Soundpools with a huge range of professionally produced sounds and loops, which you can use to sketch out a track or to enhance one of your own arrangements. Get inspired and start producing music at the hit record level today! 316 unique loops for grating metal music joined together with gentle symphony elements - Symphonic Metal contains hard as nails guitar riffs and complex double bass drums, but also features dreamlike synths and furious strings. A unique combination of diverse influences, welded together in symbiosis. House by the Sea features bombastic club sounds and party music on the chart hit level. Create infectious dance tracks with this Soundpool and 265 included loops, featuring brilliant back beats, dreamy synths and melodic keys. Gentle, chilled-out music - this Soundpool is perfect for relaxed vibes. Fantastic keys, a laid-back Rhodes, smooth guitars and a total of 301 loops - Acoustic Sessions is a sound collection that has relaxing moments in the bag. If you want to feel the funk, the Uptown Soundpool will bring you pure joy. It includes 247 loops with all sorts of funky rhythms, crisp bass sounds, groovy guitars and supernaturally good pads for that authentic old school feeling. A Soundpool for moody movie scores. Score: The Dark Side includes a total of 273 loops to bring musical tension to your compositions. Includes a whole range of strings, basses and brass as well as guitars and choirs. Ideal for dark comic adaptations. Indian flutes, Greek strings in combination with oriental, African and Indian percussion rhythms - World Affairs is a unique Soundpool with a grand total of 539 loops from diverse music cultures. Beautiful sounds from all around the world melt together here. Recording with Samplitude Music Studio. Apply recording templates and use an integrated tuner for string instruments, and record vocals or instruments simultaneously on several tracks. Recording templates get your projects ready for recording guitar, piano, vocals or an entire band without the need to adjust any further settings. A template loads a track for the recording with EQ, compressor and other effects and another track for drum loops etc. Record vocals, rap or instruments in 24-bit/96 kHz studio quality on up to 16 mono tracks or 8 stereo tracks simultaneously. With multitrack recording you can record, edit and mix band practices, demo tapes or complete albums in studio quality on multiple tracks in parallel. With the integrated tuner, you can make sure your guitar, bass or ukulele are perfectly tuned before you start recording. Simply play a string into your mic, and Samplitude will show you if the pitch is correct or, if it's not, how out of tune it is. Samplitude Music Studio offers many professional solutions for audio editing in order to shape your tracks the right way. The new MIDI Velocity Dynamics panel can be used to control the velocity dynamics of a recorded MIDI instrument. Edit, modify and manipulate the velocity dynamics at any time to achieve the right feeling for your track - during the recording process, or afterwards. With Vocal Tune 2, correcting your vocal recordings is simple. The pitch curves and wave forms help you keep track of everything and can be used to edit recordings in detail with the pencil tool. Develop ideas at home and take them with you to practice. You can display the notation for your compositions, arrangements or basic chord progressions in the MIDI Editor and print them as needed. Combine all your takes and objects into groups at any time. Group all the objects in a track or in several different tracks, and move them together, edit them or add effects. Easily adjust the pitch of samples or audio files without affecting playback speed. This feature is great for making quick harmony changes in arrangements. If your music project needs to pick up a little speed, you can adjust the playback speed of your audio material without affecting the pitch, thanks to the zplane algorithm. The gentle cycle for your hard drive and RAM without loss of sound quality: Recordings made with VST plug-ins or effects can be easily converted to 32-bit floating format using the track freeze. A transition solution that creates a lasting effect: use the Cross-Fade editor to design your own transitions between different audio files. The optimal recording usually doesn't consist of just one take, but is a combination of the best parts of several recordings. The program enables you to keep sight of everything when you're "gluing" individual pieces together into one big audio object. Spare your nerves and your PC memory. Aux busses and sub busses allow you to do professional audio editing work with a wide range of effects or compression on separate help tracks. Effects bring your ideas to life. Professional effects in Samplitude Music Studio enable you to achieve incomparable sound for your songs. Use track, object and vintage effects and a virtual guitar amp and vocal modulator to give your sound that extra kick. The new version of Samplitude Music Studio also contains essentialFX Suite with eleven high-quality effects. The flexible gate plug-in offers noise reduction with soft knee options and sidechain filter function for rhythmic ducking effects. Optimized for vocal and speech recordings: This channel strip offers compressor, DeEsser, gate, high-pass filter and sound shaping. A classic compressor for level compensation for audio material and for adding punch - includes a soft clip function and an advanced side chain filter. eFX Tremolo Pan lets you achieve classic tremolo effects and edit rates, shapes, tremolos, tempo synchronization and panoramas. eFX Chorus Flanger offers everything you need for more depth for your sound - from chorus effects to flanger sounds. In addition, easily define settings for frequency, depths, feedback and mix. With eFX DeEsser, filter out unwanted "s" sounds from speech and vocal recordings. Add more movement to main tracks and more dynamics to guitar. This classic phaser effect also includes settings for speed, depths, feedback and mixes. eFX Tubestage contains pre EQs and post EQs and an oversampling mode for creating an impressive analog sound - perfect for simulating the authentic, warm sound of analog tube amps. Access enhanced volume for audio signal and reduced clipping with this efficient and dynamic limiter. Apply short or long reverb times to your audio - with eFX Reverb, which brings more space and atmosphere to your sound. With individually adjustable delays for both channels and a sophisticated tempo sync feature, stereo delay is suitable for any track. Manipulate sound on an individual track with the parametric 6-band equalizer and use settings such as the bass killer, super woofer and boosts for high and mid-range frequencies. Modify the sound of individual song components - without adding effects to entire tracks or by working with complex automations. For instance, you can apply a pitch or flanger effect to just a single word in a vocal recording. Vintage effects for creating the ultimate '80s feeling. In addition to classic effects devices such as chorus, flanger, delay, distortion, filter and tape simulation, the AM Track SE gives your songs a distinct vintage sound. Effects templates for the virtual bass & guitar amps Vandal SE, such as overdrive/distortion, tremolo, and chorus, recreate the sound of analog amplifiers while also offering a completely unique sound. Experience your vocals as you've never heard them before. The Orange Vocoder from Zynaptiq modulates your vocals and give tracks a futuristic sound. Samplitude Music Studio offers professional mastering tools for the highest precision when fine-tuning the entire mix. Use the mastering suite, auto mastering, 6-band EQ, multiband compressor, marker manager or the new master automation function in order to add the final professional touches to your songs. The new version of Samplitude Music Studio includes a master automation function. This simplifies mastering and can be used to define the behavior of various parameters in the master channel - e.g. volume or panorama - and additional parameters while the track is playing. Professional tools for an even more professional sound. Samplitude Music Studio includes a StereoFX module, multiband compressor, 6-band equalizer, limiter, MultiMax and tons more features and effects - all of which enable you to create unparalleled sound. Mastering is one of the most demanding and specialized aspects of music production and requires extensive experience in sound perception. Auto Mastering analyses your audio material and finds the perfect sound settings for your song. The parametric 6-band equalizer lets you set volume for individual frequencies, giving you the freedom to play around with the sound of your song. The Marker Manager increases interface clarity for album production. It enables you to filter and edit a whole range of markers like track or pause markers in complex mastering projects. Produce music at the same volume level as the latest chart hits. The multiband compressor splits the input signal into individual frequency bands which can then be individually manipulated in terms of compression strength. Before publishing extensive mastering sessions, you can edit MP3 ID and CD text data right in the project and export all songs as individual tracks. For even better audio results. Samplitude Music Studio offers a wide range of tools for sound analysis, which create a visual representation of the sound. This way you know exactly what needs to be done to achieve a better sound result. Use the visual analysis tools for mixing and tidying up the frequency range or other purposes, such as finding masked frequencies in the stereo field. The program includes a vectorscope, spectroscope and spectrogram, among other tools. The direction meter shows you what your production's sound looks like in the stereo field. This lets you assess mono compatibility better and carry out precise adjustments where they're needed. The peak meter displays the peak level for your production. If certain values are exceeded too often, you should lower levels for the corresponding cause or lower the frequency range. This enables you to avoid overclipping in a song. The new Samplitude Music Studio features powerful 64-bit technology and offers a whole range of features for a seamless workflow. Multicore support, an internal hybrid audio engine and VST2 support and tons more - in Samplitude Music Studio, there are virtually no limits. In the new version of Samplitude Music Studio you can load and work with up to 32 instruments - double the amount in the previous version - within a single project simultaneously. This enables you to achieve a fuller sound for your compositions. 64-bit and multicore support allows you to use your system's processor and memory to their full potential. This enhanced performance becomes particularly noticeable when using RAM-intensive plug-ins and working with large, complex mixes. The internal Hybrid Audio Engine is used by professional sound engineers and producers the world over and provides optimal latency management during recording and playback of your tracks. Samplitude Music Studio offers VST, ReWire and DirectX support for additional instruments and effects. It also includes VST3 plug-in support for integration, automation and VST multi-output. Available interfaces include: VST3, VST2, ASIO, ReWire, SMPTE, MTC, MC. Record melodies on a MIDI device or create rhythms with your mouse. You can then easily edit everything in the MIDI editor. Choose between the piano roll, score and drum editor views. MIDI data can be adjusted and created in various ways with mouse modes such as Velocity. Samplitude Music Studio supports the Mackie control protocol and conventional hardware controllers. You can move the fader in the mixer or use an external controller to make live automatizations - levels are adjusted automatically to fit the progression. Start or stop a recording on your computer directly from the sound booth or modify the sound of the instruments with the free MAGIX Audio Remote app for smartphones and tablets. The Quickstart Wizard helps you set up entire projects for recording, composing or improvising in a matter of clicks.